Team Engauge before the race. I didn’t get the color memo apparently. The race started at 7:30 and we spent the half hour beforehand picking up our bib numbers, stretching and mingling with other members of Team Engauge. 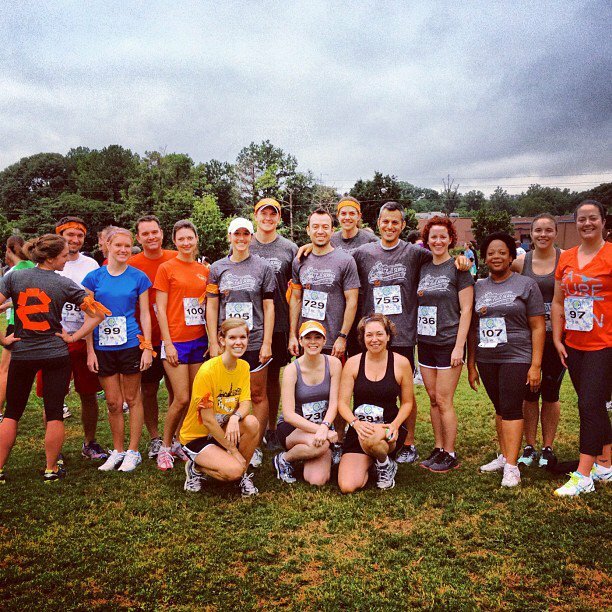 Once we started queuing up at the start line, I realized this was not going to be your typical 5K. How’s the best way to put this? The course was a little…off-road. We spent the first ¾ mile running through mud, gravel, grass and rocks. Definitely not my idea of fun but it made me even more grateful that the remainder of the race was on flat, smooth road. Drew and I ended up finishing together, at a much faster time than I thought. I assumed that because of the first leg of the course, I’d have a pretty poor finishing time. Drew, the veteran runner, knew we were going a much faster pace than I thought and tried to tell me as much. I on the other hand was acting quite stubborn and didn’t believe him. As we approached the finish line and our time of 24:54 flashed above us in red lights, I could hardly believe it. Turns out my time was good enough to score 2nd place overall in my age group, and I now have a cool coaster/medal to show for it. Considering my goal time of 27 minutes, I was very happy with the outcome. 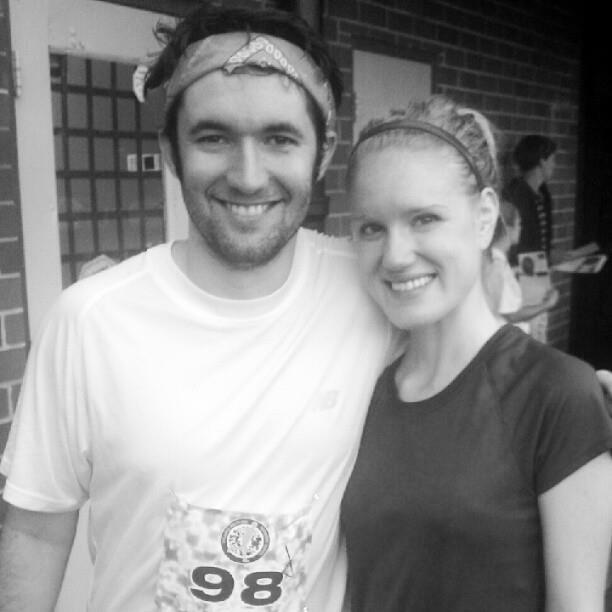 We’re already talking about signing up for the Atlanta Beltline Eastside 10K come December. 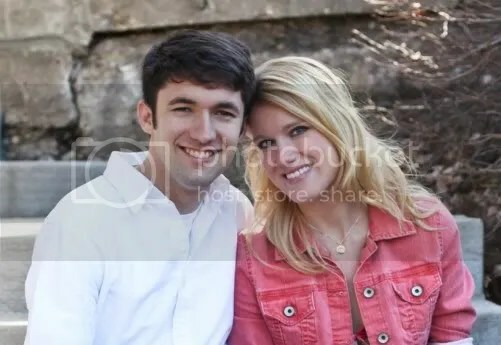 I know it was especially important for Drew to be able to spend some quality time with his Engauge friends, as he’s starting a new chapter in his career this week. 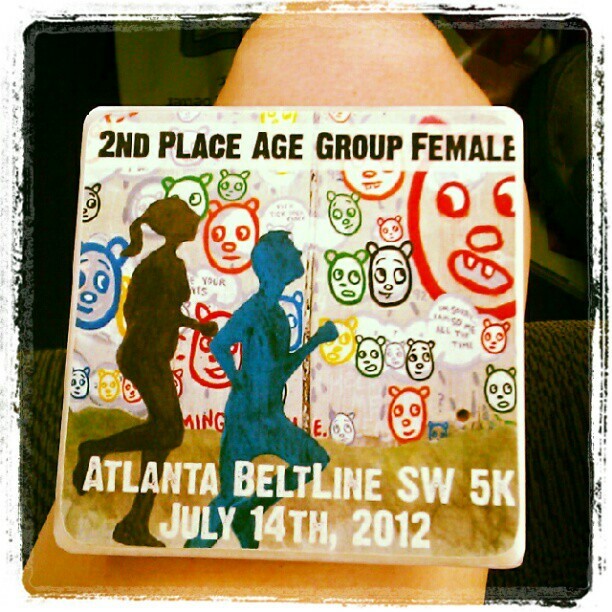 My 2nd place age group finisher medal/coaster! Good eats at Publik. 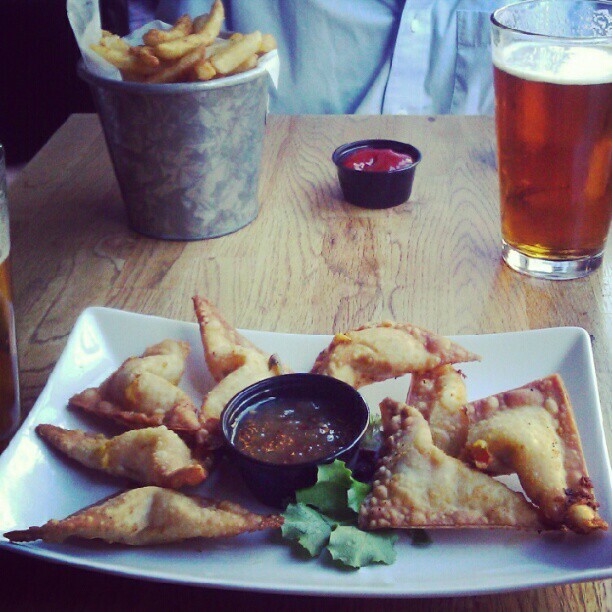 Fries and curried sweet potato wontons…and beers, of course. We spent Sunday morning in church, followed by lunch at a new-to-us Mexican restaurant with some friends. I pass Perla Taqueria every day on my commute to work, but had never been. Glad to know there’s yet another place Drew and I can go when a taco craving strikes. 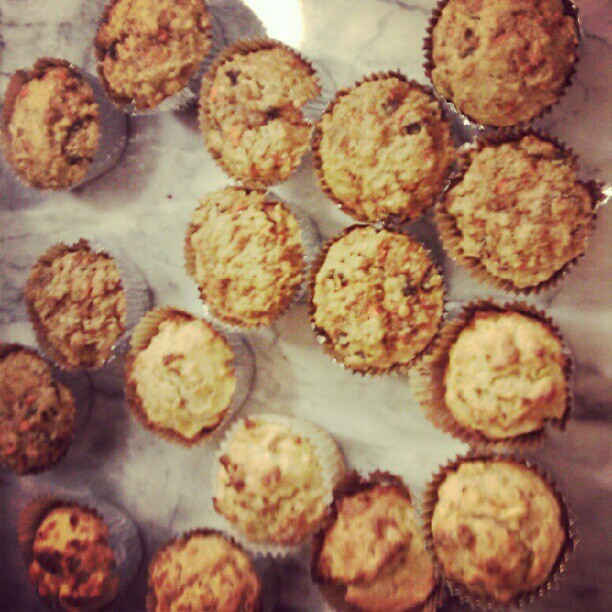 I then spent the majority of the afternoon baking, making several dozen apple cinnamon and bran muffins. Drew made oreo-stuffed chocolate chip cookies, a delicious cookie invention he made up back at Christmastime when we had a cookie exchange with our house church group. Needless to say, our apartment smelled gooood. Preheat oven to 375. In a large bowl combine the flour, sugars, baking powder and cinnamon. Add in chopped apples. In a small bowl, whisk together the milk, egg and butter or oil. Pour in the large bowl and stir until just combined; don’t over-mix. Spoon batter into muffin tray lined with baking cups. Bake for 15-20 minutes or until tops are slightly brown. Preheat oven to 350. In a large bowl combined flour, flaxseed, wheat bran, brown sugar, baking soda, baking powder, salt and cinnamon. Add in carrots, apples (if using), raisins and pecans. In a small bowl, whisk together milk, eggs and vanilla. Pour into flour mixture and stir enough just to combine; do not over-mix. Spoon batter onto muffin tray lined with baking cups. Bake for 13-15 minutes. Congrats on taking second place in your age category!! Sounds like you all had a fun weekend. NICE job on the race, lady!! Good job with the race! I grew up in Atlanta and have recently moved to Florida because of my husbands job but seeing your pictures of the braves, etc makes me miss home!